Is it time to consider a new youth development policy in Hong Kong? 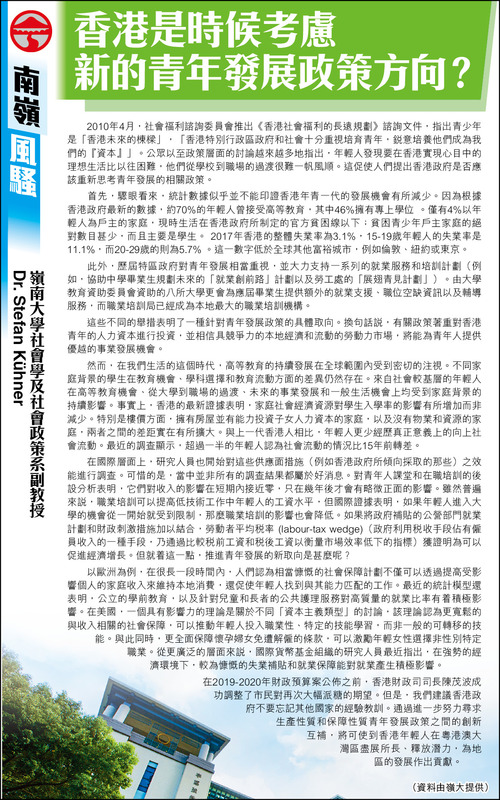 Appeared in Sing Tao Daily (in Chinese). Please follow link for full article. “In the Long-term Social Welfare Planning in Hong Kong Consultation Paper, which was published by the Social Welfare Advisory Committee nine years ago in April 2010, it was stated that young people are “the future pillars of Hong Kong” and that the “Hong Kong SAR government and the community as a whole attach great importance to nurturing and developing them into our “capital””. There has since been a growing perception in public and policy discourse that young people in Hong Kong have found it more difficult than before to build a ‘good life’ for themselves as they have faced an “increasingly bumpy transition from school to work”. This begs the question whether the Hong Kong government should reconsider its approach to youth development in Hong Kong. At first glance, statistical headline figures make it relatively easy to brush aside any notion of diminishing opportunities for the younger generation in Hong Kong as around 70 per cent of young people pursue post-secondary education—46% at degree-level—according to the latest Hong Kong government figures. Merely four per cent of households headed by young people live below the official Hong Kong poverty line; the absolute number of poor young people headed households is small and affected mainly students. The overallunemployment rate in Hong Kong stood at 3.1 per cent in 2017 with the rates for young people – 15-19 years of age: 11.1% and 20-29 years of age: 5.7% – comparable or considerably lower than in other rich global cities like London, New York, or Tokyo. Not least, it would be unfair to dismiss the emphasis that successive Hong Kong governments have placed on youth development by investing significant resources into a whole range of employment services and training programmes, such as for instance, the ‘Career Let’s Go’ programme for secondary graduates, or the Labour Department’s Youth Employment and Training Programme. The University Grants Commission-funded universities offer additional employment support, information on vacancies, and counselling services for future graduates, while the Vocational Training Council has become the largest provider of vocational training for adult learners and school leavers. These various initiatives are indicative of a specific approach to youth development policy, which focuses on investments into the human capital of Hong Kong’s young people, and puts faith in the power of the competitive local economy and fluid labour market to promise fulfilling careers to all of Hong Kong’s youth. Yet, we are living in a time where internationally the persistent valorisation of higher education has come under scrutiny as differences in university access, subject choice, and educational mobility have persisted for students with different family background. In particular, the disadvantage of young people from lower-status family backgrounds are perpetuated from higher education admission, to their transition from education to employment, their future career development, and general life chances. Indeed, the latest evidence for Hong Kong suggests that the effect of socio-economic family resources on student enrolment increased – rather than decreased – in importance. Particularly housing affordability issues have widened the gap between those who own housing and have the ability to invest in their children’s human capital and those who cannot. Compared to the previous generation of Hong Kongers, fewer young people experience any real upward social mobility, while over half of them – according to recent surveys – believe that social mobility is worse than 15 years ago. Internationally, researchers are also beginning to build a bigger evidence base on the effectiveness of supply-side activation measures like the ones favoured by the Hong Kong government. And the news is unfortunately not all very good. Meta analysis of classroom and on-the-job training for young people have shown that their income effect is close to zero in the short term and only becomes slightly positive after several years. While vocational training has generally been found to boost young people’s wages at the bottom end of the skills distribution, international evidence suggest it is less successful if it limits university access of young people as is the case in Hong Kong. The effect of the labour tax wedge, which measures market inefficiency by comparing before- and after-tax wages, on employment has been found to foster more economic growth primarily if combined with subsidised public sector employment schemes and fiscal stimulus measures for the economy. But where to look for new approaches to youth development? In Europe, for example, more generous social protection schemes have for a very long time been argued to not only maintain aggregate consumer demand in the local economy by way of enhancing household incomes of affected individuals, but also enable particularly young people to search for jobs commensurate with their attained skills. Recent statistical models suggests a positive effect of public early education, child- and elderly care services on high quality employment rates. In the United States, an influential theoretical literature on different Varieties of Capitalism posits that the availability of more generous earnings-related social protection enhances incentives for young people to invest in specific, vocational rather than general, portable skills; at the same time, greater protection against dismissal in the case of pregnancy is argued to act as an incentive for young women to enter non-gender specific careers. More broadly still, researchers at the International Monetary Fund have recently suggested that more generous unemployment subsidies and employment protection have a positive effect on employment in strong economic context. Social Welfare Advisory Committee (2010) Long-term Social Welfare Planning in Hong Kong. Consultation Paper. Wu, X. G. (2010). Hong Kong’s Post-80s Generation: Profiles and Predicaments. Hong Kong: The Central Policy Unit, The Government of the Hong Kong Special Administrative Region. This entry was posted in Uncategorized on March 18, 2019 by stefan-kuehner.